* Helps to boost immune system, works as a powerful antioxidant that scavenges free radicals thereby providing anti-ageing benefits. *Helps in lowering blood sugar. *Helps prevent cavities and tooth decay. *Helps reduce the risk of cancer. *Helps lower bad cholesterol level and prevent heart disease. *Protects cartilage by blocking the enzyme that destroys cartilage and reduces the risk of rheumatoid arthritis. * Helps in reducing high blood pressure. *Helps to relieve stress and anxiety. *Works as an antibacterial and antiviral agent and helps in treating influenza and diarrhea. 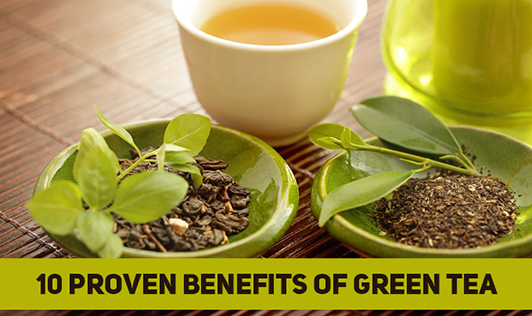 In today's fast food era where we do not have control over our diets, a simple beverage like green tea can help us in maintaining a good health.